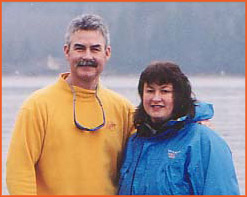 The idea of opening a kayak company in Ladysmith came about when Bud was working in the Haida Gwaii Islands in 1997. He observed kayakers peacefully paddling past him and knew Ladysmith would be the ideal location for a kayaking business. Having scuba dived all along BC’s coastline he realized within the calm waters of Ladysmith Harbour was an abundance of wildlife and its proximity to the Gulf Islands sealed the deal. Bud’s former career in Commercial Diving & Forestry Management and Sheryll’s career in Recreation & Education have been perfect backgrounds to form this exciting recreational and educational venture. The Bells and their four children have lived and worked in Ladysmith for the past 24 years. 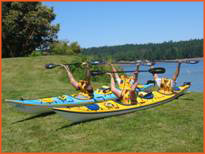 They have offered sea kayak tours, lessons, clinics and rentals from Transfer Beach, Ladysmith since 1997. Some of Sealegs’ team members have been working with the Bell family for over a decade and are generally from the Island and local area. 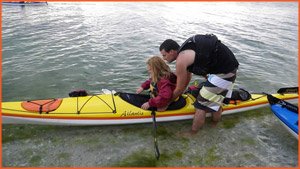 The Guides are members of the Sea Kayak Guide Alliance of BC which requires them to update credentials every 2 years and to keep their kayak leadership logs up to date. Continuing education is important to Sealegs. The company conducts in-house clinics for its Guides, Assistants and waterfront staff. As educators, the Sealegs guide and administrative team realize the importance of updating skills and keeping current with new information and legislation that affects their fields of expertise. All rentals and tours include a free introductory lesson and rates include safety gear for you and the boat including a PFD, throw rope, paddle float and pump. Every effort is made to provide clients with a safe, comfortable, positive and memorable outdoor experience. Your safety is our priority and we stake our reputation on it. Click here to read what previous clients have said about safety with Sealegs. Since wilderness adventures do not come with the creature comforts of home, we make sure we prepare you with helpful information ie sun protection, water, proper attire, eyewear straps and dry bags. Our guide team helps with PFD fittings and sets up the rudder pedals and seat adjustments. On our guided tours we “teach as we go” to ensure you use proper paddling techniques so that you are comfortable in the kayak and you enjoy your paddle. On our custom events and day tours, we provide meals that are nutritious, delicious and plentiful, taking special effort to satisfy dietary needs. We treat our clients as we treat guests to our home. We want you to have a refreshing, exhilarating outdoor experience. If we don’t live up to your expectations, we want to hear from you so we can maintain our relationship with you. Our business has been successful because of our repeat customers. We have earned our customers’ trust and honour this trust by continuing to provide exceptional service and a great experience. Once your safety and comfort are assured, it’s time to have some fun. Our professional guides are in this business because they love working in the outdoors, they love meeting new people and they love being in, on and around the ocean!